Are you looking for the server upgrade and installation? Or are you thinking of moving to the Cloud? You can completely trust that our expert technician will successfully deliver your server project on time. 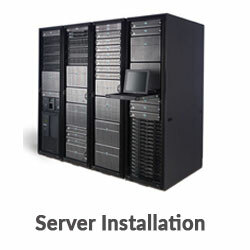 We’re local server Installation Company. Our professional technicians fully provide server upgrade, installation, and migration services to any local company who are seeking an expert team to manage their next server project. We are budget-friendly and pain-free. We can easily and quickly install, rebuild and configure your server to your specific requirements. We support Oracle Solaris, Red Hat Enterprise Linux, HP-UX, windows server operating systems and IBM-AIX. However, we’re an expert in operating RHEL on a 64-bit platform or windows server OS family. 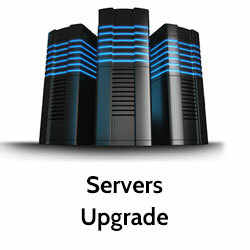 We’re Highly Experienced Server Upgrade, Installation and Migration Experts. We can be a full caretaker of your next server project from planning to development. We can play an advisory role in giving strategic guidance and advice to your IT project. We have a wide range of server installation skills, knowledge, and experience. Data Storage, Continuity and Backup – Including raid setup, online backup suggestions, data archiving, migration and tape drive installation. What Kinds of Servers Do We Install or Configure? The cloud services are services that are used over the Internet. They are not physically installed on your computer. It is a new paradigm that has emerged with the advent of the World Wide Web. Before the cloud appears, all the software is installed on the computer. Cloud services are programs that are hosted on a server. We can group the services of the cloud in several categories, A standard user will typically use only SAAS. This is the most utilised one. The software is hosted on servers of the providers, and the client accesses it through the web browser. Everything related to maintenance, support, and availability is handled by the provider. In this type of cloud services, the provider offers access to a cloud-based environment in which users can create and distribute their own applications. The provider provides the underlying infrastructure. A service provider offers software and applications over the Internet. Users subscribe to the software and have access to it through the web or the provider’s APIs. Greater implementation speed and shorter response time. Access to applications and data from anywhere in the world and on any device. Rapid scalability to instantly meet any demand. Better use of your infrastructure investments. Lower costs of infrastructure, energy, administration, and workplaces. Better security and greater protection of your information. We have all the cloud services that your organisation needs to provide a quick solution or safely of each different projects. We can also handle your failing Server project. You have a server upgrade project, but the project has gone into difficulties. Don’t worry because we could help you in this situation. Our expert IT consultants will play an advisory role here and ensure successful results. For our server upgrade and installation services, we also provide an ongoing server management service. The service covers: scheduled maintenance and updates, onsite break-fix support, remote troubleshooting, and administration. A member of our consultancy group will go for an initial meeting with your department’s head or IT staff. As the result, we will be able to understand all your requirements and both will have a clear-cut idea for the benefit of the next project. After we have had a discussion of your requirements, we will take an action of our plan that includes the scope of works, requirements, costing etc. Our management team will start off the project of server installation once the details are approved, and date is fixed to start a project. The project won’t be considered as a complete work until it is signed off by the decision maker who would confirm that you’re happy with the project results. We have years of experiences for successfully completing server projects. We’re one of the main Server Installation Companies that offer a complete Management service, from planning to design and ongoing maintenance. Take the first step to ensure a successful service project. Take the first step and contact us! We will schedule a meeting with you to discuss your requirements and advise you on the best possible solution.